The BOV Winter League will get under way on March 22 with six teams competing in the Premier Division while the First Division will be formed by five teams. 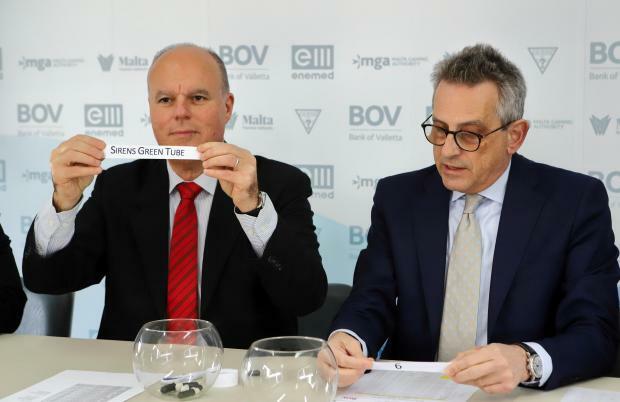 The fixtures schedule of the pre-season competition was drawn during a press conference at Aquatic Sports Association headquarters by president Joe Caruana Curran and Anthony Scicluna, Chief Officer at Bank of Valletta. On the opening day, Neptunes will face Exiles while holders San Ġiljan take on Sirens. Caruana Curran said that ASA Council have yet to decide on whether the new waterpolo regulations will be used in the Winter League. “The ASA Council will be meeting shortly to decide if the new game regulations introduced shorlty by FINA will be adopted as early as the BOV Winter League,” Caruana Curran said. Caruana Curran also heaped praise on a number of young players who are showing a lot of promise during the Enemed Cup which is currently being played at the National Pool. “We are very pleased with the performances of a number of young players in the Enemed Cup currently underway,” Caruana Curran said. On his part, BOV Chief Officer Anthony Scicluna said that the development scheme is aimed at helping emerging talent to gain the necessary training and experience to maximise their potential. “The Youth Development Scheme is aimed at assisting young players obtain a training and playing experience abroad and witness play at a higher level than we are accustomed to,” Scicluna said. Division One: 6.15pm Otters Nivea vs Ta’ Xbiex Amigos. Premier Division: 8.15pm Exiles Elia Caterers vs Neptunes Leo Vegas. First Division: 3pm Marsaskala Fish & Fish vs Marsaxlokk Brown’s. Premier Division: 4.15pm San Ġiljan TUM Invest vs Sirens Green Tube; 5.30pm Sliema Frank Salt Real Estates vs Valletta Videoslots.